Welcome back, girls! It has been a while, but we will make up for it with today’s collection. For a while now, we have been focusing on the lower body and it’s about time we changed the pace a bit. Yes, winter is finally here and no, we will not be looking at jackets today. Much better, in fact! We have picked out 7 lovely ponchos and capes that can be worn throughout the seasons. Ponchos are a great choice if you prefer feeling free and unrestrained. 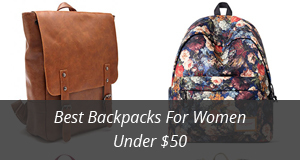 Not just that, but they are also a fashion choice that you cannot go wrong with. Whether worn over dresses or a shirt and pants, a stylish poncho will take your outfit and look to a whole other level. 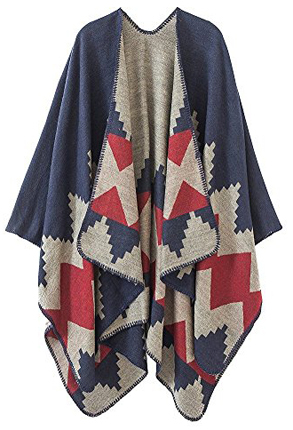 Let’s not waste another second and let’s get started with the first poncho, which is by Ilishop and it’s the Reversible Oversized Blanket design. This beautiful poncho is made of a blend of Polyester and Acrylic, which makes it very warm and flowy. The design itself is made to resemble a very wide, oversized scarf that you throw around your shoulders. This creates two wide and open sleeves and an asymmetrical lay in the front and back. What’s great about it is the style, as it goes with both classy and elegant dresses, as well as casual outfits. 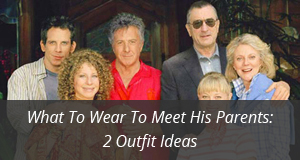 This way you can wear it anywhere and look refined and stylish at all times. As for the color options, there are four to choose from, which include: Black, Khaki, Purple and Red. 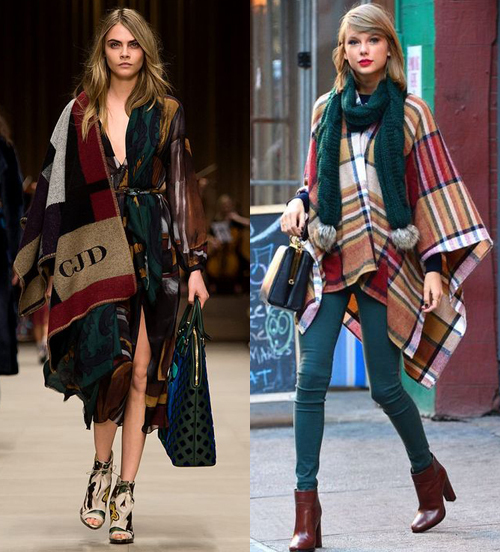 These are mixed colors, with square prints and varying shades that really do wonders for the poncho’s look. You are surely going to love this next cape by Novica and what’s not to love! This is a handmade product made with Alpaca wool and Acrylic blend that keep it warm, comfortable and lightweight all at the same time. It is designed as an oversized wrap, that you can wear in several different styles, such as a poncho or as an over-the-shoulder wrap. It is called Brown Tweed, because of the smooth Jersey Tweed knitting and the color. The designer, Alfredo Falcón has taken it a step further with the lovely handmade crochet border. As a last touch is the deep rich Brown color, that really distinguishes this beautifully made cape. Designed by Urban CoCo, Block Shawl is a must-have for cape lovers. The design is so elegant and chic, that you can mix and match it with many different outfits. And for that price, it would be a shame to have just one! The fabric is knitted and made of 60% Cotton, 35% Polyester and 5% Spandex. This blend is warm and cozy and it adjusts to all body types and sizes. It has an open front and a V-line neck on the back, which goes well with the design, as both the front and back end in V-shape. The back is a dovetail design that looks casual and carefree, which matches well with the elegant front. 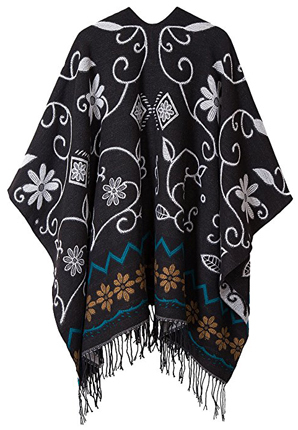 It is a very retro style poncho that comes in around thirty colors and prints. Bears mentioning: Black, Navy, Camel, Purple, Red and Coffee series. 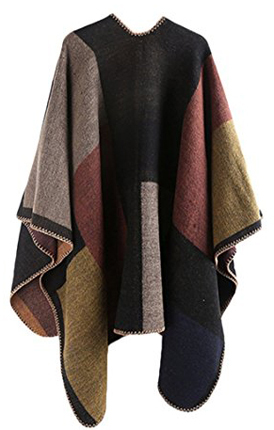 If you are a fan of prints and patterns on your clothes, you will absolutely love ReeneC.‘s Cardigan poncho. The material is a blend of Polyester and Wool, which are woven together to create a lightweight and thin poncho, that is sturdy and warm. 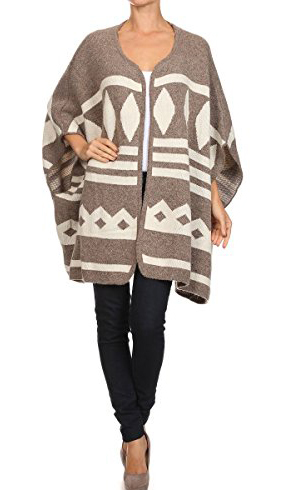 It is a poncho with an open front and a lovely A-line neck. The design is very well-proportioned, as it fits properly on the shoulders and it is the perfect length, ending just above the knee. It creates two oversized and open sleeves for the hands, which are quite practical, especially for the busy ladies. 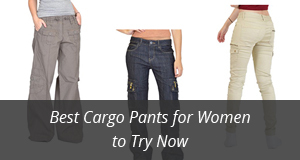 The style is very casual, yet elegant and feminine and it goes great with pants. There are fifteen colors and patterns to choose from, such as: Tribal grey, Orange fringe, Snow leopard, Striped brown, Ivory fringe and Plaid tan. 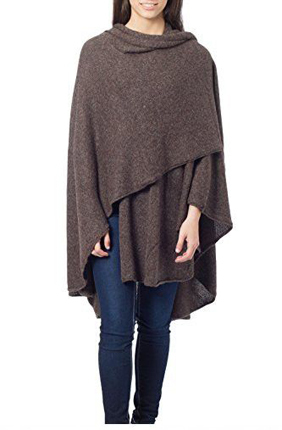 Close in design to the Block Shawl, VamJump‘s Blanket Cardigan poncho comes with rounded edges and in a one-size fit, for most body shapes. Despite being really oversized, it is lightweight and comfortable, so you can move around freely while wearing it. The material is Faux Cashmere that imitates the softness of real Cashmere, but without its fragility. This comes in handy for an everyday wear, because trust us, you will not want to get this poncho off. It has an open front and lays on the shoulders like a cape, with oversized sleeves and a rounded V-neck in the back. The next best feature, right after its comfort, is the color selection, which is abundant and includes over twenty options. Some of these options are: Black, Navy, Khaki, Navy blue, Red, Green and Coffee. Made of 70% Acrylic and 30% Wool, the Tartan knitted poncho by Chaos Theory Outlet is a great choice for autumn, early winter and spring. It comes in a checkered design, with multiple colors mixed in layers, creating a lovely look. 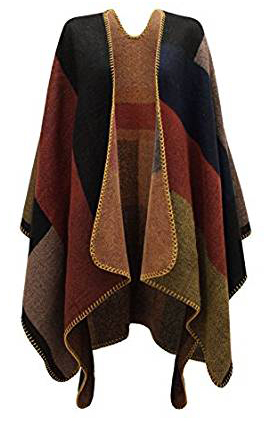 This color placement on the poncho helps it to be versatile in wear, as it goes well with different styles and outfit colors. It measures about 110 cm long, so it is quite lengthy and provides good cover. This is a warm poncho, but not very thick and heavy, which is good if you will be wearing it daily. It is a sleeveless design, with an open front and in a chic style with numerous folds both in the back and front. There are four colors to choose from: Multi color, Multi grey, Purple and Red/Black. We are at the last choice for today’s selection and we will be finishing with Urban CoCo‘s Retro Tassel poncho. It is made of 70% Polyester and 30% Cotton and it comes in one-size. 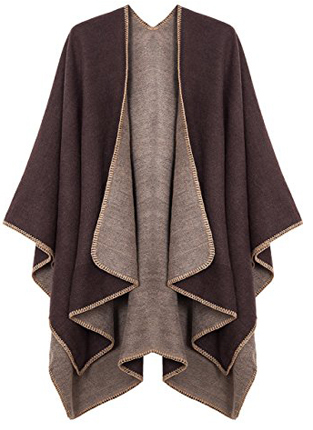 It is a long, but not too wide poncho that has an open front and sleeves. What’s different about it is the fringed hem in the back, that adds some sass and style to the design. It wears like a cardigan cape and it is a beautiful choice for casual outfits and everyday wear. The color selection includes fourteen options, such as: Black 2#, Black, Purple, Red, Blue, Deep grey, Pink and Navy blue.